I had a friend ask me once why we bought our car "new". Honestly, I had never thought about it before. We never buy "new" "new" cars. They are usually last years model or even the year before. For one reason or another they have not been bought so we do. They are new to us. But I will have to admit we do like new stuff. But I am not talking new as in this year's model, I am talking new as in only just invented. My husband just loves gadgets and his friends even buy him strange food for his birthday because they know he likes new and trendy. We had the first Apple computer, electric knife, blender, food processor...and the list goes on and on. I even have a portable inductions burner unit because my husband thought it would be cool and we had never seen one like it! 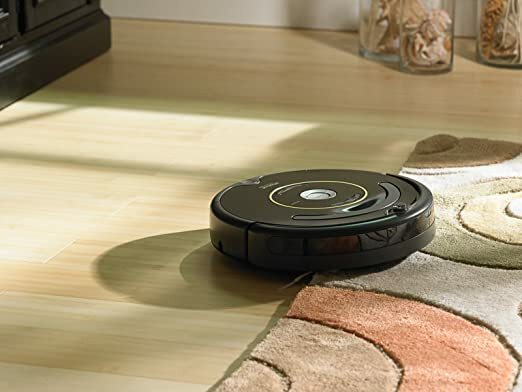 So, you should not be surprised that we now are the proud owners of an iRobot vacuum. I can iron AND vacuum at the same time. This little gadget may be my favorite of 55 years of the latest and greatest. I just love it but not for the reason you would imagine. I love it because is has so much personality. The little thing has a name because I thought she needed one...Elsa has been with us for several weeks now and she seems to have a mind of her own. I talk to her when she get distracted and wanders off into a room that I had not planned on cleaning. You will find me chasing her down the hall. "Stop, stop! Where do you think you are going?" She loves my dining room and when I set her to clean the kitchen, she will sneak around the corner and I will hear her bumping into chairs and exploring under the china hutch. I have not told my friend about her yet. It takes a special person to understand my foibles. But, you can bet that her name will be coming up in the conversation. She just makes me laugh. That is a very good thing! Unlike your husband, I'm not an "early adapter" of all the new gadgets. But that iRobot vacuum does sound pretty fantastic! You can bet is it...when was the last time you bought a new appliance and thought "This is really fun?" See what I mean? Hi, Barbara - We seriously were in the market for a new vacuum cleaner. After I read this post, my husband and I did a bit of research and decided to purchase a Roomba 655. We have been absolutely amazed by how clean it gets our floors (and how easy it is to use). Thanks for the recommendation. PS - You are correct - iRobot vacuums do have TONS of personality! I must confess. I just bought a spiralizer. I saw one on a blog and just had to have one too. I made zucchini noodles and it was great fun! Tasty too. Even unadventurous eater Andy like it. I want a spiralizer!!! Darn! If I had one of those it would be a three ring circus around here with the dogs losing their minds!